To nie jest poradnik treningowy. To przede wszystkim analiza tego czym jest CrossFit pod względem społecznym. Jak zmienia ludzi, tworzy więzi. Autorka - Allison Belger jest psychologiem, ale także instruktorem fitness. Prowadzi kilka klubów CrossFit i pokazuje nam masę historii ludzi, których poznała tam. Mówi o tym jak aktywność fizyczna wpływa na ludzi, ale tłumaczy przy okazji dlaczego następują w nich zmiany, które nie zdarzały się wcześniej np. w czasie lekcji aerobicu czy jazdy na rowerze stacjonarnym. As co-owner of four CrossFit affiliate gyms, Allison Wenglin Belger juggles management of the family business, her work as a licensed psychologist and fitness coach, and her role as mom to two young daughters. She knows first-hand the importance of community--of having a network of mutual support and human connection in the midst of our hectic, technology-driven lives. A former division-one collegiate soccer player and five-time marathoner, she has also been part of the wilderness adventure community and has trained for various elite athletic events, competing both individually and as part of a team.Belger takes the reader on a journey from her childhood in suburban New York as she follows her passion for fitness and sport, with pleasures and pitfalls along the way, finding a new dimension in the CrossFit culture and its emphasis on camaraderie and community. She explains the transformative aspects of CrossFit's physically and mentally demanding workouts as performed with others. Drawing on her psychology doctoral research, Belger describes the emotional and physical benefits of participation in an affinity group. She shares the stories of military wounded warriors and everyday heroes who have faced life-threatening illness--all with the help of their community affiliation. She relates inspiring examples of individuals who have created communities and support networks for populations in need, including underprivileged youth and cancer patients.With her unique perspective as psychologist and athlete, the author explores the mind-body connection and how it can relate to all of us. 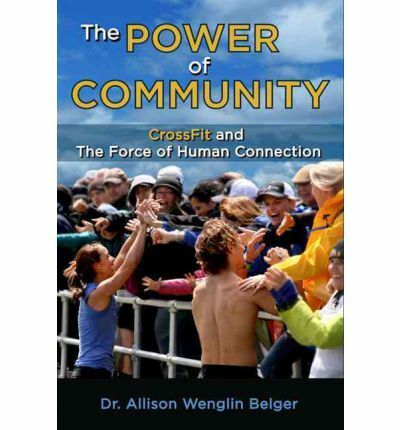 Through her compelling narratives, each of which intersects with the CrossFit experience, Belger encourages us to examine our own lives and relationships so that we may find motivation and meaning in a world of stress and challenge--if we are open to the power of community.